Dissolve 1 tablespoon yeast and 1 tablespoon of the sugar in the water, then add the milk and pour into a large bowl. Add the egg and the additional yolk, salt, lemon zest, flour, the remaining 2 tablespoons sugar, and the butter. Mix together with your hands, then knead dough on a pastry board until it becomes sticky yet elastic. Cover the dough in a bowl and let rise in a warm place for at least an hour. If you want to prepare it ahead, place the dough in the refrigerator overnight, then let it warm to room temperature before rolling and cutting. Dust a pastry board with flour. Roll the dough out to a 1/2-inch thickness. Using the top of a glass, cut into rounds about 2 inches in diameter, and let rise 30 minutes more. Pour at least 2 inches of oil into a heavy pot and heat until it is about to bubble (or do as I often do – in an electric wok at 375 degrees). Drop the doughnuts into the oil, 4 or 5 at a time. Cook about 3 minutes on each side, turning when brown. Drain on paper towels. Using a pastry or cupcake injector, insert a teaspoon of jam into each doughnut. 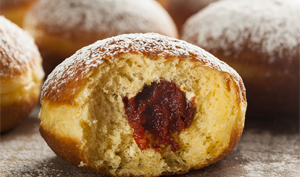 Roll the sufganiyot in confectioner’s or granulated sugar and serve immediately.